Something I’ve noticed this year about the irony of American Exceptionalism: Those who trumpet it most have it least. American exceptionalism is about being a nation rooted not in shared backgrounds but in shared values: freedom, democracy, the rule of law, equality for all. We thrive because we recognize our diversity as a strength, and respect to each other as an imperative. It is ironic that many who proclaim American Exceptionalism as their badge of honor tend to use it to foment divisions. I have always admired Goldman Sachs as the smartest of the smart, as "the" Investment Banking firm. When I haven’t gotten a chance to catch up with emails and reports, and I go back and notice "forecasts" and predictions from columnists or analysts, I love taking a look at how accurate they were. We expect core inflation to be contained in a range of 2.5-3.0%. We expect that the Fed will continue easing in 2008 with the Fed Funds rate ultimately settling at 1.25% to 1.75%. We anticipate 10-Year Treasury yields to range between 3.5-4.0% for 2008. Our central case scenarios for 2008 call for operating earnings of $75, respectively, and reported earnings $67. These estimates result in an S&P 500 price target of 1475-1540 for 2008 year end. They also provided a "Bad case" scenario, where the S&P would end in 2008 at "1200." That was their bad case scenario. Well, we are still a few weeks away from year-end, but so far it’s tanked far below, at 896 AFTER a nice rally (it hit a low of 752 on Nov 21). Their "positive case" was S&P 500 hitting 1600. So much for my thinking at least Goldman knows what’s going on. Nazila Fathi reported in the New York Times that Iran recently executed a man it claimed was a "spy" and has arrested another one also for "spying." 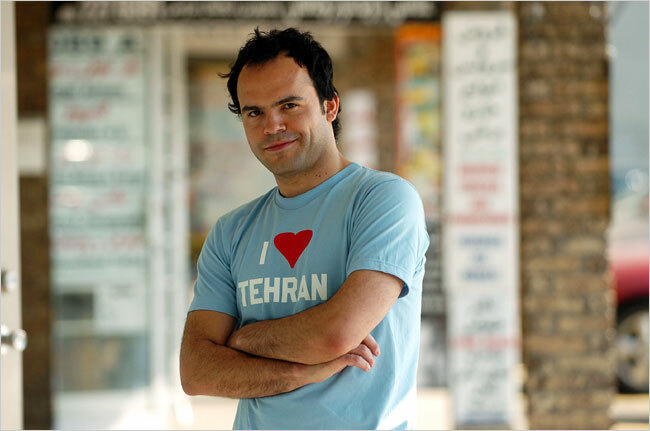 This second man, Hossein Derakhshan, is among the most famous Persian bloggers. Hossein is jailed & threatened with the same fate of execution by the Iranian government. His crime? 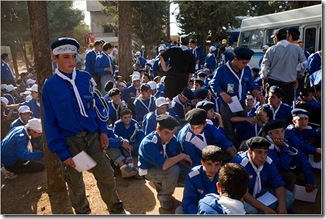 Trying to humanize Iranians and Israelis towards each other. A couple years ago, he apparently defied a ban on travel by Iranians to Israel in order to explode stereotypes about Iranians to Israelis, and to report from his blog about ordinary Israelis to Iranians. As a Canadian-Iranian, presumably he figured he could get away with it – and visited twice, then dared to return to Iran. The object of his visit, Derakhshan said, was to show his countrymen Israel’s human face and to detoxify relations between the two peoples after Ahmadinejad called for Israel’s elimination. "I want to humanize Israel for Iranians and tell them it’s not what the Islamic propaganda machine is saying – that Israelis are thirsty for Muslim blood," he said. "And I want to show Israel that the average Iranian isn’t even thinking about doing harm to Israel. I want them to see Iranians who don’t look like Ahmadinejad." The Iranian regime accused him of spying, as it conveniently does of any humanist who threatens the Iranian regime. I felt a lot of anxiety when I first read about this story. After all, if Hossein indeed took such risks for the sake of humanity (and particularly for the sake of Iranians and Israelis who are turned against each other by divisive politicians), shouldn’t we all (regardless of religion or political orientation) demand his release and stand behind him? I read Hossein’s blog and was struck at how much it pandered to Ahmadinejad. It has a weirdly pro-Ayatollah and pro-Ahmadinejad slant lately. Ahmadinejad’s brilliant strategy of dismissing Israel and smiling to the U.S. has divided the the U.S. in all levels and that’s a big achievement comparing to Khatami’s weak anf failed U.S. strategy that led to Iran being part of the ‘axis of evil’. Now the same Bush administration has officially opened the diplomatic line. Please get over Ahmadinejad’s scruffy look, prayers, and plain language and see these achievements. d) Nothing is as it seems and there is something else going on. Initially I thought it my duty (and that of anyone who believes in freedom and justice) to try to bring attention to Hossein’s plight. To contact every Muslim, Arab as well as Western and non-aligned politician, dignitary, academic, and business leader who has any possible sway over the Iranian government and urge them to release him. To reach out to Obama to ask him to ask the Iranian rulers for an act of good faith. To prod the Canadian government to seek the release of their citizen. To encourage human rights and peace groups to get behind a campaign which could not only achieve freedom for Hossain but also use his story to inspire others to disavow blind hatred of the other. Does anyone have any thoughts or information? Years ago, terrorist attacks by pseudo-Islamic terrorists were not aggressively condemned by Muslim leaders. Their position was, "why should we have to take a stance on this? We didn’t do it and do not need to go out of our way to deny such vicious acts." Plus significant portions of the Muslim population did not feel ire against those acts, distant as they seemed. Everyone remembers the tragic support that Osama Bin Laden used to have in Arab and Muslim countries. That has long changed, as the tide against terrorism has turned, moderate voices have exerted leadership, and Muslim leaders have learned to react swiftly against those who claim to speak in the name of Islam through violence. Ordinary Arab and Muslim citizens increasingly recognize that vicious acts of murder against innocent civilians by terrorists who claim to speak in the name of Islam tarnish their religion and the image of its people and must be assertively countered. They also realize that "creating a monster" comes back to haunt them, as has been exemplified by the brutal acts of Al Qaeda in Mesopotamia. Yet the Western media gives scant attention to these condemnations. Showcasing the voices of moderates just doesn’t garner as high ratings. For years OneVoice has been tracking and trying to publicize stances against violent extremism from mainstream leaders across religious, ethnic, and national spectrums. More and more organizations and governments are taking a strong stance. But the "other" audiences continue to miss the news, underreported as they are. Below is a sample (by no means exhaustive) compilation of some of the Arab and Muslim nations and organizations across the world – from Saudi Arabia to the Arab League – who condemned the tragic and barbaric terrorist acts in Mumbai. Everyone can always do better, but the below can be shared whenever you are asked "Why are Muslims not condemning terrorism?" I got a note from a friend in Gaza a couple weeks before the latest breakdown of the cease-fire, which means what you read below has only gotten worse. "you can hear the people complaining about the situation and cursing the day that Hamas was voted in. The people say that Hamas had tricked them into voting for it and after that Hamas had destroyed their lives." Michael Lewis (from "Liar’s Poker") wrote a piece in Portfolio Magazine that is a must reading (this earlier piece is also very good). It is at once nauseating, chilling, and fascinating to see how our financial system is a house of cards. A couple years ago I got into a passionate debate with friends from the financial sector about the growing disintermediation between actual products we make in the "real" economy and the derivative products that get packaged and re-packaged and sold – always generating a fee for the financial firms that hawk them – without really creating value. Michael Lewis explains better than anyone how this came about in the 80′s and how it came about with the current credit crisis. The saddest thing is that, while there will be some short fixes and a lot of chest-thumping in Congress, by the media, and in the executive corridors, the system is so sick and so rigged by those that benefit from it, that it is unlikely to be structurally fixed. As Lewis concludes in his piece, it would require that Wall Street firms go back to operating as private partnerships with skin on the game rather than become publicly traded firms where management can pass on long-term risks to shareholders, benefiting from short-term profits even if they are risking the fate of their institutions. Or it would require enough regulation that really tracks and connects compensation to long-term value creation. Yet greed and ingenuity are potent combinations. And the "smart" guys will always find a way to game the system – with your money. Even as we witness calamitous losses on the market, many insiders are doing quite well for themselves. They find the way. They are survivors. Several of my friends are in this industry. They are not bad people. They are just playing by the rules of the system, which banks on our own greed as investors to sustain and legitimate itself. It is hard not to be tempted to participate in the market once it has been so depressed that it should have nowhere to go but up. And yet Lewis points out that someone who would have invested in the 80s in the predecessor to Citigroup would have lost more than half the value of the investment – rather accrue growth over a 22 year period! And for the young people out there thinking what to do with their careers – many of whom Lewis laments having misread his book as an alluring tale for an exciting career – find something you can truly CREATE. There are sooo many opportunities to make this a better world through concrete businesses that truly improve life and society. There are so many opportunities to make money and do something truly good. To build something that adds value. Find one that is real. Shay and I had walked past a park where some boys Shay knew were playing baseball. Shay asked, ‘Do you think they’ll let me play?’ I knew that most of the boys would not want someone like Shay on their team, but as a father I also understood that if my son were allowed to play, it would give him a much-needed sense of belonging and some confidence to be accepted by others in spite of his 20 handicaps. However, as Shay stepped up to the plate, the pitcher,recognizing that the other team was putting winning aside for this moment in Shay’s life, moved in a few steps to lob the ball in softly so Shay could at least make contact. By the time Shay rounded towards second base, the right fielder had the ball . the smallest guy on their team who now had his first chance20to be the hero for his team. 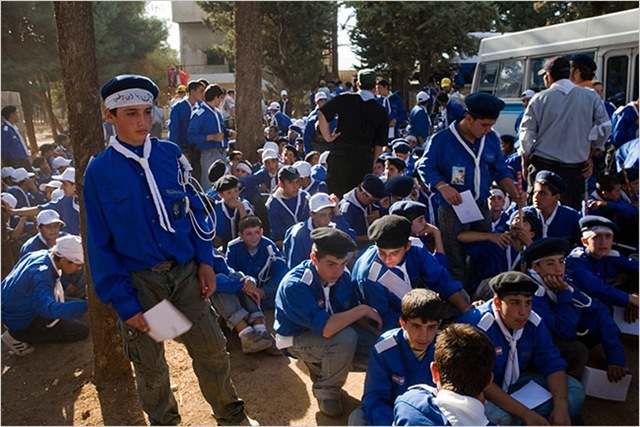 Read the entire article pasted below or in this link about Hezbollah’s Boy Scouts – to appreciate the challenge before society: the institutionalized hatred and seriousness of the threat posed by Hezbollah, its backers, and other movements with such nihilistic visions. It is chilling. We have no alternative but to counteract this in a smart and tenacious way. To defeat absolutism and terrorism, force is only a partial answer. Far more important than force is a better ideology that can trump and expose dark movements as unworthy of the young people they prey upon. It is not easy, but it can be done. Like we are doing through OneVoice for millions of Israelis and Palestinians to reframe the conflict and understand the enemy is not each other but violent extremism and militant absolutism that denies the rights of both peoples to a State and Freedom and Security, we need to also build a countervailing movement and philosophy that moves the Mideast (and other regions) away from the us-vs-them hatreds and into the post-Obama world of globally shared human values. If we are to tackle the challenges that the 21st century will present to humanity – from climate change to nuclear proliferation, from resource scarcity to nihilism and militant absolutism – we need to ensure that new generations worldwide share this recognition that they have to work together – realizing their shared humanity. Gretchen Morgenson wrote here an excellent piece in the New York Times about how Merrill Lynch executives systematically dismantled all risk-control mechanisms while pursuing unfettered profits, and how this led to the company’s downfall. Smaller businesses have to similarly navigate between the drive for profits and the need for caution. Many years ago I realized how important this tension is to the proper management of a company. Our sales team always wants (as is correct) to sell more, and will complain that the Operations team sometimes won’t grant enough credit to a customer, or will freeze shipments to a customer that is late on its payments, causing sales to slow down. Our team managing accounts receivables has the opposite instinct – be conservative, be cautious, and do not ship to delinquent customers till they pay, even if that hurts sales. A short-sighted entrepreneur will dismantle this protection, and may override its credit department at its own peril. The temptation is certainly there. Why aren’t we shipping product to customers that are asking us for it? Isn’t this what we are in business for? But sales are not real sales unless you are able to get paid. And while the credit department has to be professional and know how to work with its customers to ensure good relations, steady payments, and steady shipments, it is important to respect the need for these safeguards. After all of Sean Hannity’s admonitions about how an Obama Administration would cave into the Iranian regime, guess who is scared of Obama?! The Iranian "revolutionary" leaders – who apparently recognize that Obama’s nuanced approach and integrationist vision is a threat to their divisive vision. "People who put on a mask of friendship, but with the objective of betrayal, and who enter from the angle of negotiations without preconditions, are more dangerous," Hossein Taeb, deputy commander of Iran’s Revolutionary Guard Corps, said Wednesday, according to the semiofficial Mehr News Agency.